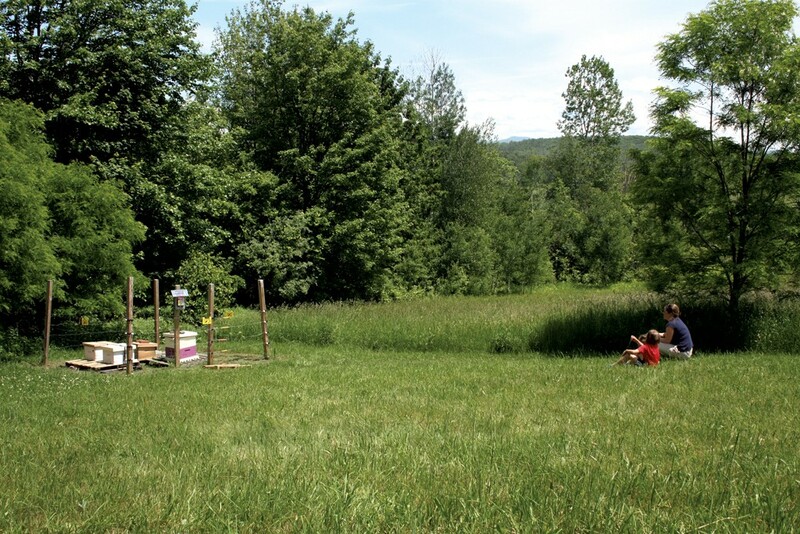 Habitat: Backyard Beehives | Habitat | Kids VT - small people, big ideas! On a muggy night in July 2015, Eric Howe pushed two hives of swarming honeybees into the trunk of his Subaru and drove two and a half miles from his family's old house to their new home in Williston. The hot, stuffy conditions were miserable for this sort of maneuver, and the bees tried to keep cool by clustering on the outside of their hives — wooden boxes holding frames filled with honeycombs. But covered from head to toe in his white cotton beekeeper's suit, hands steady on the wheel, Howe made the trip without bodily harm. Both the bees and the Howe family settled nicely into their new home, situated on a 3-acre plot of land in the middle of rolling farm fields. From their sunroom, the family has a view of the hives, which are enclosed by an electric fence to discourage bears. The Howes have been keeping bees for five years, and have become comfortable with their colonies. After just a few stings, they've come to understand that if they don't bother the bees, the bees won't bother them. 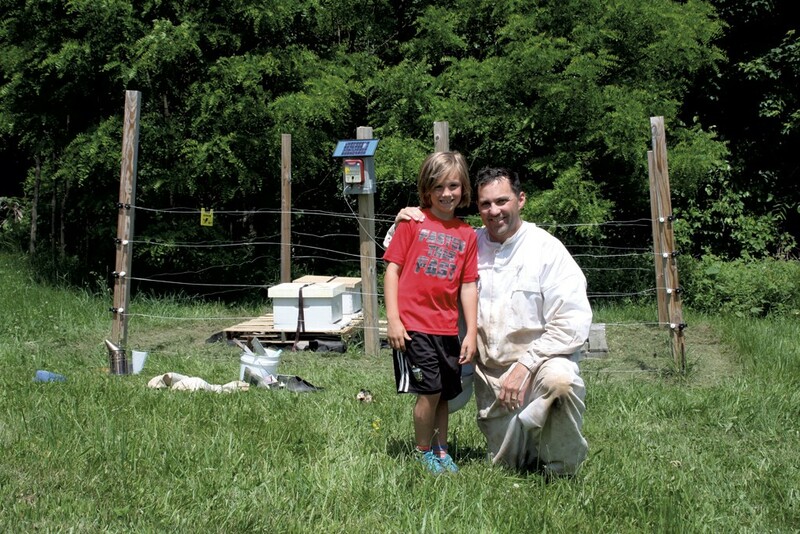 Their son Avery, 8, and his 4-year-old sister, Charlotte, like to sit in the field and observe as their dad tends the bees in his beekeeper suit, a getup that earned him the name Bee Man from Avery. A commitment to homesteading and environmental sustainability drove Eric and his wife, Carrie, to start raising bees. The insects are also relatively low maintenance, says Carrie. A colony of bees can take care of itself for days at a time. Picture books often show bees in a yellow hive hanging from a tree, but beekeepers' hives are wood boxes with frames inside. The interior of each frame is made of wax that the bees use as a guide to make their honeycomb. Every week or two, Eric calms the bees with a smoking can so he can check to see if the frames are full of honey. If so, he sets a new box — filled with empty frames — on top of the old box. After a full season, the hives look like a stack of filing cabinets. The Howes harvest honey each year around Labor Day, removing the frames and cutting off the wax caps that the bees apply to each cell of finished honey. The family relies on a friendly beekeeping community to lend them an extractor, a contraption that uses centrifugal force to spin the honey out of the frames. Since a single hive can produce as much as five to six gallons, the family has plenty for the coming months — with extra for gifts. The kids drizzle honey on baked goods and use it to sweeten lemonade. Both children also take a spoonful to help with allergies and sore throats. Carrie uses the wax to make candles, lip balm, and a salve that the family puts on cuts and scrapes. Unfortunately, loss of bees is common during Vermont's cold winters, so they've had to replace their colonies several times. Even so, the family can't help getting attached to their backyard guests. When a familiar black and yellow insect zips by, Avery pipes up: "There goes one of Dad's bees!" The Howes are members of the Vermont Beekeepers Association, a resource for people raising bees across the state. 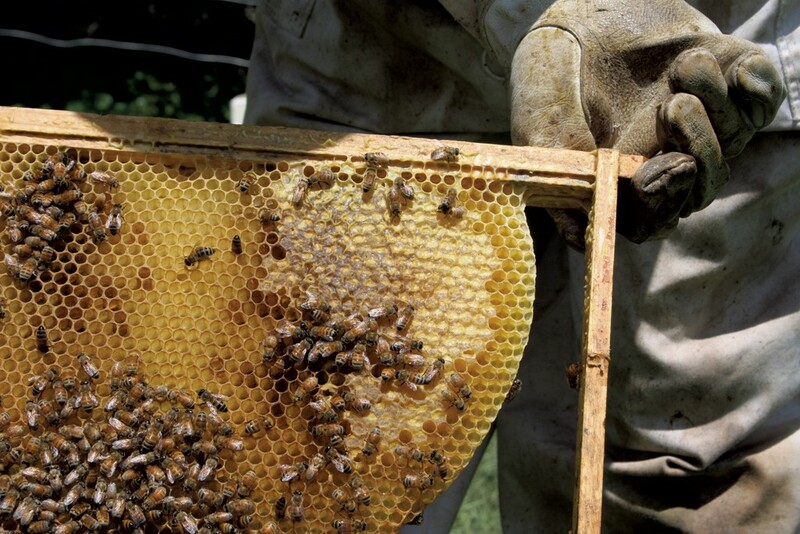 The 9,000 hives tended by its members produce 700,000 gallons of honey each year. Eric took a beekeeping basics class at Access CVU at Champlain Valley Union High School in Hinesburg before getting started. Their initial investment for bees and equipment was around $1,000. The Howes bought their first bees from Vermont Beekeeping Supply in Williamstown. They purchased two nucs, or nucleus colonies, which are fully established colonies of a few thousand bees that contain all the stages of the bee life cycle — a queen, workers, drones, newly laid eggs and larvae. Nucs are often the first purchase for new beekeepers since they provide an entire established colony. The Howes recently increased their number of colonies from two to four. Read more about the Howe family's homesteading adventures on Carrie's blog, happyhivevt.com.